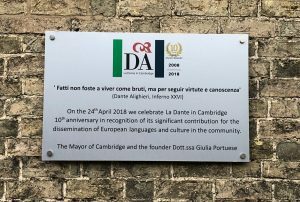 Cambridge – On 24th April 2018 a commemorative plaque was unveiled outside the European Cultural Centre La Dante in Cambridge during a ceremony that took place at the centre in the heart of the city to celebrate its 10th anniversary. 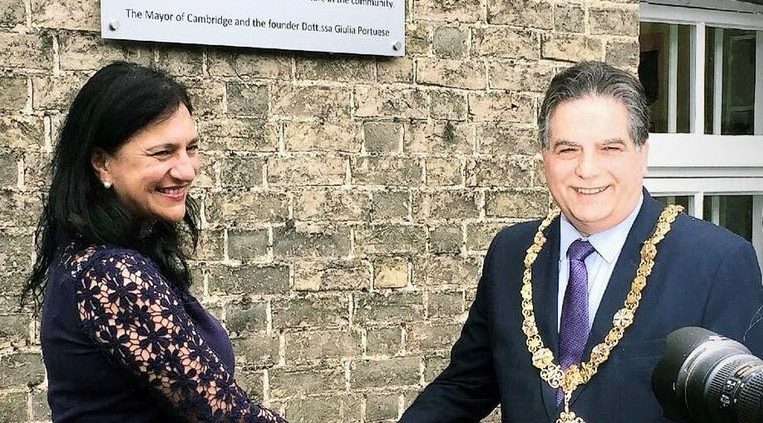 The Mayor of Cambridge, Councellor George Pippas, to mark this milestone said: ‘Cambridge is a great city made up of unique people. We have a strong community of Chinese, Italians, Greeks, Bangladeshis, and Europeans. So it is like a patchwork in which everyone contributes to the success of the city of Cambridge. I am the first European Mayor elected here in Cambridge and I understand the importance of teaching first of all our children how to communicate, but also the adult people. I fully support what the European Cultural Centre is doing and I am fully impressed. I am also impressed to see so many adults. In Cambridge the Educational establishment is well known in the world and we endeavour in working hard to keep these standards very high. I am pleased that La Dante is developing not only a remarkable language experience where people learn Italian and Spanish and English, but has a weight in the cultural impact they have in our community’. 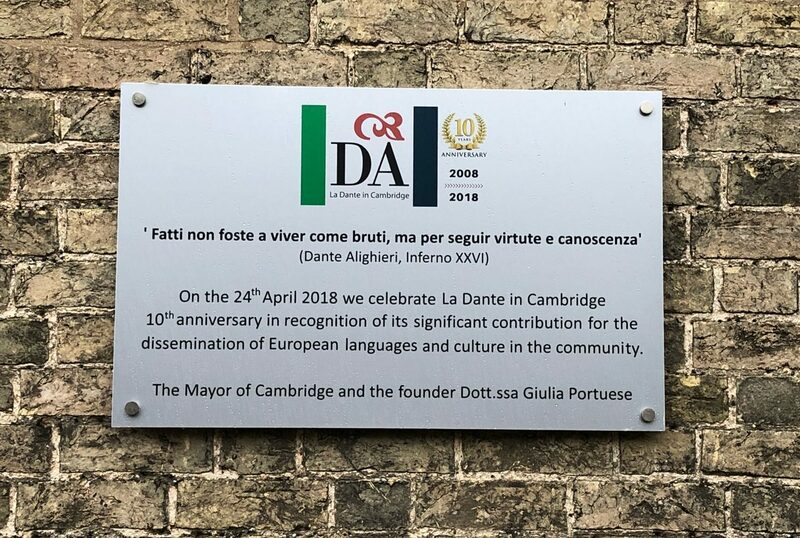 The main aim of the European Cultural Centre La Dante in Cambridge is to promote knowledge and enjoyment of Italian, Spanish, and English language and culture. 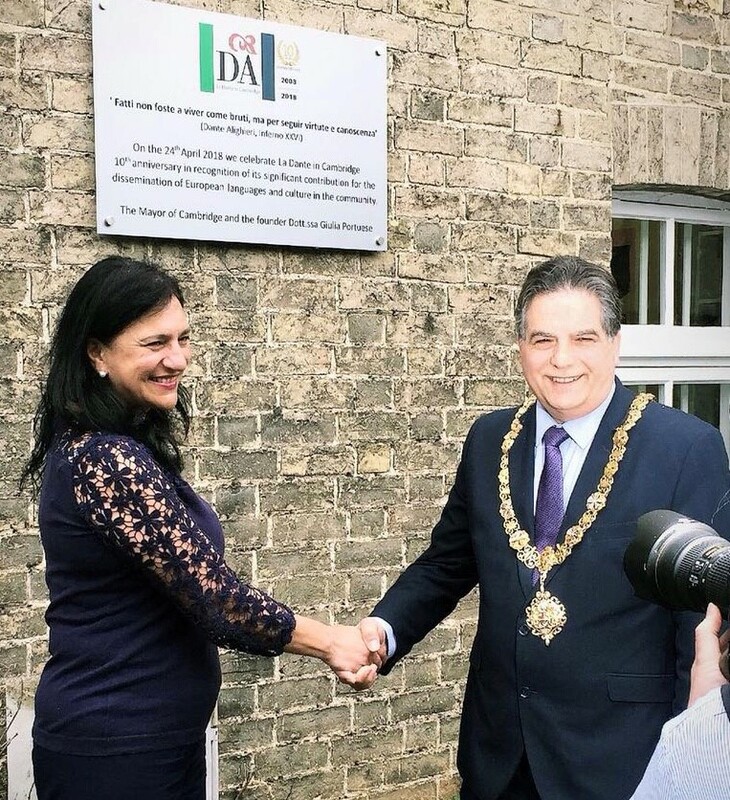 Since 2008 when the Director Giulia Portuese-Williams founded it, La Dante in Cambridge has played a major role in language learning through its unique communication approach, and combining language and cultural traditions. Over the years, it has established partnerships with the most important cultural educational establishments in Cambridge, such as the University of Cambridge, Fitzwilliam Museum, Art Language Location, UKTI, Italian Chamber of Commerce, Italian Consulate and Cambridgeshire Chamber of Commerce to support the community in language learning provisions.